Cardiff - Senior Wales players have urged manager Chris Coleman to stay on despite the heartbreak of failing to qualify for next year's World Cup finals in Russia, a report said Tuesday. Britain's Press Association said Coleman met with key players -- including the injured Gareth Bale -- at the team hotel following their 1-0 defeat to the Republic of Ireland in Cardiff on Monday. 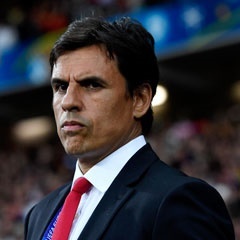 The squad have reportedly given their unanimous support to Coleman and it is also understood that the Football Association of Wales is hoping Coleman extends his near six-year stay at the helm. Coleman said in the immediate aftermath of the Ireland defeat that he would hold talks with the FAW over his future. The manager said after Wales had reached the semi-finals of Euro 2016 that the 2018 World Cup campaign would be his last in charge but his stance appears to have softened. Defender Chris Gunter called for Coleman to stay. "I think everyone in Wales, fans and players, would want to see him stay on -- 100 percent," he said. "He's been a massive part of what we've done and he is the man to hopefully take us forward. "If the powers that be can give him a really good contract and make him stay, he can carry on being the greatest Welsh manager of all time." Coleman became Wales boss in January 2012 following the death of his close friend Gary Speed. The former Fulham and Real Sociedad boss led Wales to Euro 2016 -- their first major tournament in 58 years -- and then made it all the way to the semi-finals in France. "We want him to stay because what he's given this nation is something that's never been done before," said Gunter. "The message from the whole squad would be that we want him to sign a new contract."